I love vegetables. I could probably live on them alone (but then I remember my love for bbq)! I’m always trying new ways to make them so I never get sick of eating them! In a skillet, over medium-high heat drizzle olive oil. Add in cauliflower and garlic. Stir it around, allowing cauliflower to cook evenly and brown in some areas. Do this for a few minutes, then reduce heat to low. Add soy sauce, honey, lime juice, and half of the green onions. Stir and allow to cook for a few minute. Add in hot sauce and mix so it spreads evenly. Serve hot. Garnish with remaining green onions and a wedge of lime. 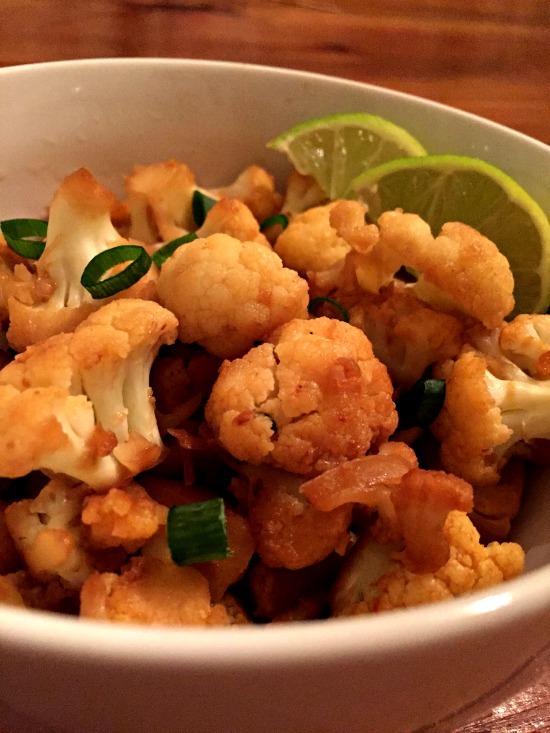 This entry was posted in Recipes/Dining Out and tagged cauliflower, Sides, vegetables.